Box Text: You've played it in the arcades. Now, play Zaxxon at home on your Sega System..in SegaScope 3-D! 01-31-2016 Flashback2012 Box Text You've played it in the arcades. 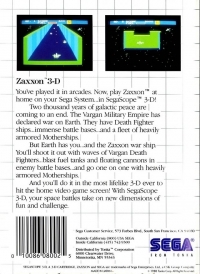 Now, play Zaxxon at home on your Sega System..in SegaScope 3-D! Two thousand years of galactic peace are coming to an end. The Vargan Military Empire has declared war on Earth. They have Death Fighter ships...immense battle bases...and a fleet of heavily armored Motherships. But Earth has you...and the Zaxxon war ship. You'll shoot it out with waves of Vargan Death Fighters...blast fuel tanks and floating cannons in enemy battle bases...and go one on one with heavily armored Motherships. And you'll do it in the most lifelike 3-D ever to hit the home video game screen! With SegaScope 3-D, your space battles take on new dimensions of fun and challenge. 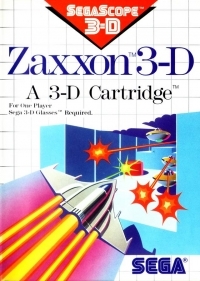 This is a list of VGCollect users who have Zaxxon 3-D in their Collection. This is a list of VGCollect users who have Zaxxon 3-D in their Sell List. This is a list of VGCollect users who have Zaxxon 3-D in their Wish List.